Gravity – An Amazing Book | What is ML Reading? Sometimes nonfiction books explain scientific terms in a boring way; not Gravity by Jason Chin. In 32 pages, and less than 70 words, Chin uses everyday objects from childhood to explain this concept. Don’t just read the words. Pay attention to the illustrations. View the obvious. Discover the inconspicuous. Only then, will you understand the magic of this book. There are two pages at the end with more words. (I did not include this in the word count mentioned above.) I consider it an afterword… “More About Gravity.” It was late so we didn’t read it. Whether you read it or not, make sure to turn to the very last page in the book. Notice the illustration. I guarantee you’ll chuckle. I’m off work today; but Monday I’m checking out his other books. 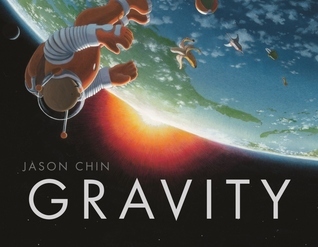 This entry was posted in Nonfiction Book and tagged Gravity, Jason Chin by mlreads. Bookmark the permalink.